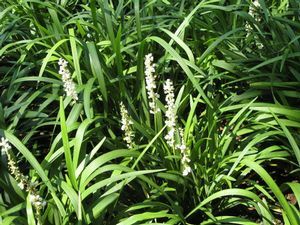 Liriope grows best in acid soil in partial to full shade, which protects it from sun damage in both summer and winter. It is valued as a ground cover, is both heat tolerant and resistant to pests and diseases, handles dry shade, and is evergreen in quality. 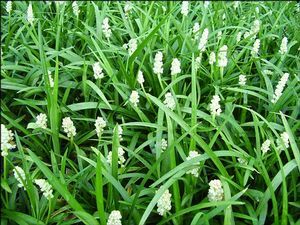 ‘Monroe White’ has spikes of white flowers in September, followed by the black berries above grassy green 12” foliage.